He became an elected member of Aosdána in 1997 and is an Associate member of the Royal Ulster Academy. Dermot currently lives and works in County Mayo. The way in which Dermot reflects Northern Ireland politics in his work is sometimes referred to as “social realism”. 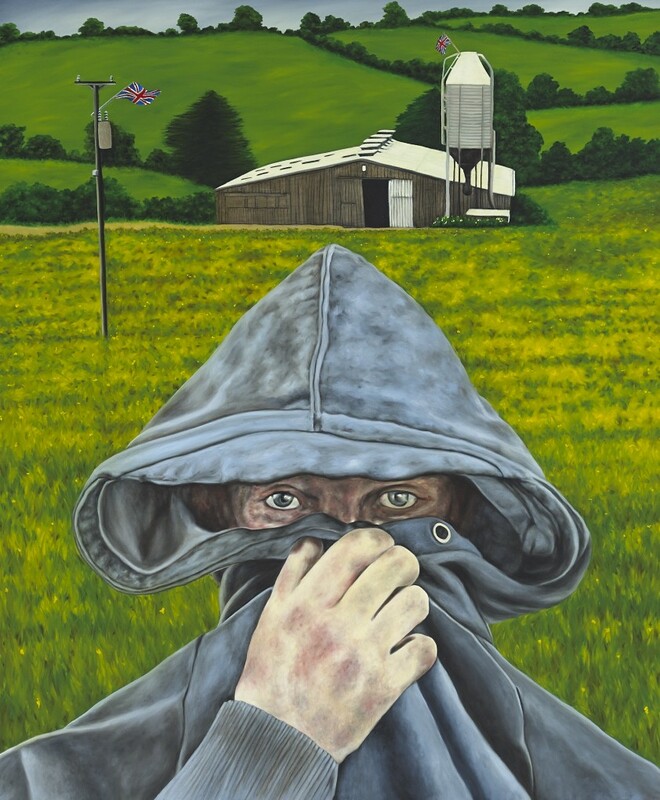 His work explores the anxiety, bewilderment and absurdity of the situation in Northern Ireland, often involving the juxtaposition of familiar imagery from the rural border regions, particularly utilising livestock, and religious and military symbols. In ‘Dissident Grey Hare’ the painting tries to capture the sinister, the suspicious, and the ambiguity of the fact that in Northern Ireland ‘nothing is ever what it seems’. The Grey Hare in the title is a term used colloquially for a subversive, but then again the figure could be and probably is an innocent farmer on a cold day in the border counties. This is the paradox of life in the North. Dissident Grey Hare by Dermot Seymour is included in the collection of the Arts Council of Northern Ireland.